A river turned to stone. Brilliant blue ravines cutting through peaks of white. A wall of ice moving slowly through through the mountains, crashing, breaking into the lake below. The Puerto Moreno Glaicer, the river of ice in the land of fire (Tierra Del Fuego). Nestled in the mountains of the most southern land mass of South America, one of Argentina’s natural wonders. We dressed quickly, layering our jackets over thermals and winter socks. We had been travelling now for over two months through South America, this being one of our final stops before returning home to Australia. It was the first time I would see a glacier up close and today I would be standing on it. Steeling my Australian blood against the freezing glacial air! 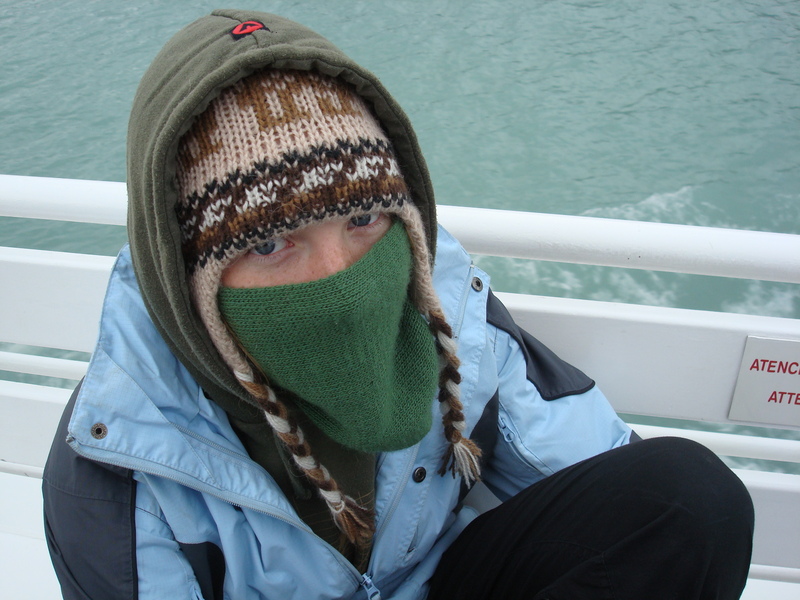 Catching the ferry over with a small crowd of other travellers, we weren’t willing to give up our view of the glacier from the front of the boat, so we wrapped our faces in scarves against the bite of the air. Glacial air. We were here. The river of ice in the land of fire. 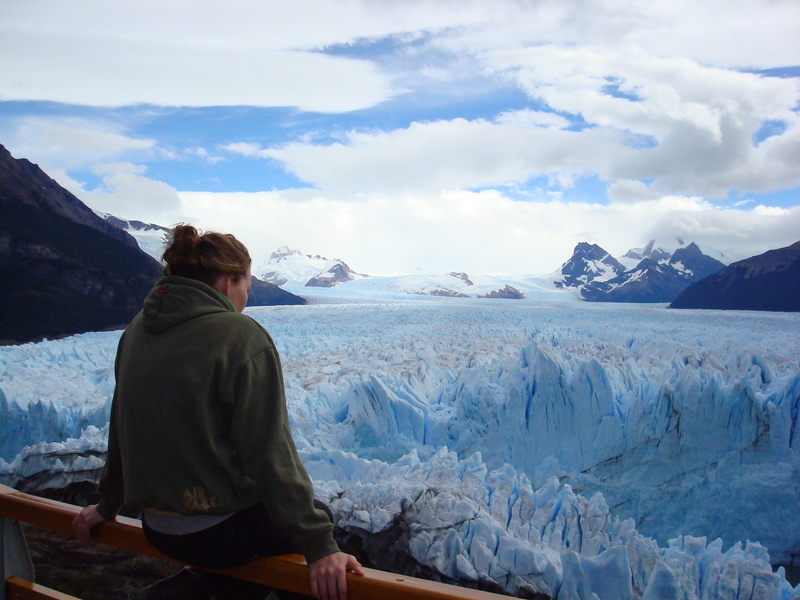 Puerto Moreno Glacier. The thing that gets me about glaciers is that they are always moving. Ever changing, melting, freezing, falling, calving, re-shaping and re-forming. We strapped on our crampons (spikes for your shoes) and took a quick crash course in glacier trekking techniques. How to use the spikes, to to stabilise yourself uphill, sideways, downhill and on flat. We stepped onto the ice. Our guide, an Argentinian man with light feet used to walking across the ice, pointed out the small rivers carving through the ice face to form sink holes of brilliant blue. Some were the size of a small tea cup, others so deep you could disappear inside. He lead us across the surface, uneven on top as the fallen snow frosted the icy surface yet smooth as glass where the water had melted a path. We were inexperienced and stayed close to the mountainside where the ice surface was partially stained with dirt. The river of ice stretched before us, leading into the crystal blue of the lake where large chunks were ‘calving’ into the water below. With each sheet of ice that fell, the valley would echo with the glacial groan. We stopped at a table hidden in the rough and uneven icy surface where we accepted a glass of whisky, each with a small chunk of ice chipped from the wall beside us only moments before. We left all too soon. We watched the monstrous frozen river from the freezing boat and again from the hillside bordering the lake. Staring out across the lake, ice, mountains and sky you experience a sense of enormity. The place we live. The wonders that surround us. 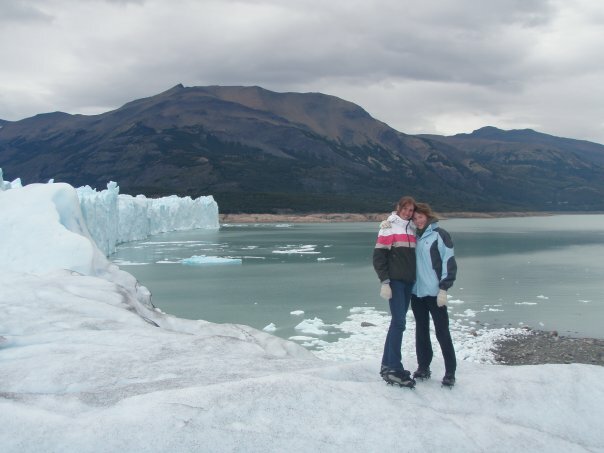 I’m told this glacier, like so many in our changing world, is shrinking. I’ve no idea when, and it seems so impossible when staring at the stretch of blue and white, remembering the feel of the ice hundreds of meters deep beneath our spiked shoes and double layered socks, but one day this wonder may all but disappear. So, go see it now, while it exists in all it’s infinite majesty. Experience the wonders of the present day and look forward to those that will come.